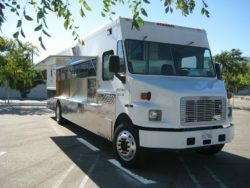 Serving safe high quality and delicious food to customers is always be a top priority for food trucks. But in addition to providing safe food, mobile food vendors must also ensure the safety of themselves and customers by using propane in a safe way. Propane tanks are convenient and economical, which make them the preferred fuel source of food trucks. Even though they are considered stable and safe, propane tanks still possess a certain degree of danger, just like any type of fuel. Common food vendor fire hazards include tanks out of qualification; overfilled cylinders; unsecured cylinders; propane cylinders inside the truck; aged or worn propane lines and unsecure connections; hot fryer oil and grills too close to tanks; burner knobs left in open position; and gas cans for generators stored too closely to tanks and trucks. 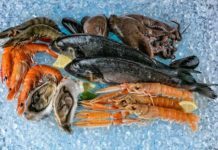 But mobile food vendors do not have to fear as there are simple steps that can be followed regarding propane tank safety and prevent harm to your business or customers. Understand the markings on your propane cylinder. These may include symbols that show what type of tank you have, the original manufacture date, and the re-certification date. Know if your tanks need to be re-certified and understand the different kinds of cylinder re-qualification. The age of the tank can affect its performance. Ensure that your cylinders are not beyond their certified number of years. Be familiar to what propane smells like. Propane tank retailers offer scratch pads that can help your employees know the distinct odor of the fuel in case of leakages. Flammable liquids like cleaning agents or gasoline should not be near a gas-burning equipment. Fumes from these can get ignited by the pilot burner. Know where the gas lines are located inside your truck so that they do not get damage when moving kitchen appliance. Also, check the condition of connections to see if there are any leaks. Never attempt to fix a leak yourself. If you suspect a leak, call your supplier immediately! Any appliance connected to problematic cylinder must not be used until the leak is resolved. Likewise until recently, there were not any National Fire Protection (NFPA) codes, standards, or guidelines to provide the minimum fire safety requirements for mobile food vehicles. 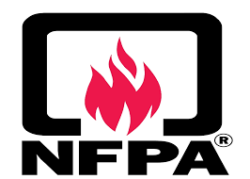 NFPA 96 – Standard for Ventilation Control and Fire Protection of Commercial Cooking Operations. Provides preventive and operative fire safety requirements intended to reduce the potential fire hazard of both public and private commercial cooking operations. Unique conditions in public and private commercial kitchens require special precautions for fire safety. Be prepared with the latest protocols in the 2017 edition of NFPA 96. 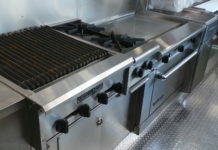 The 2017 edition adds a new normative annex on mobile and temporary cooking operations - which includes requirements not limited to clearance, hoods, ducts, terminations, fire extinguishing systems, carbon monoxide detectors, location, training, generators, LP-gas, as well as procedures for the use, inspection, testing, and maintenance of equipment. NFPA 1 – Fire Code. Advances fire and life safety for the public and first responders as well as property protection by providing a comprehensive, integrated approach to fire code regulation and hazard management. It addresses all the bases with extracts from and references to more than 130 NFPA® codes and standards including such industry benchmarks as NFPA 101, NFPA 54, NFPA 58, NFPA 30, NFPA 13, NFPA 25, and NFPA 72. Adopted in jurisdictions throughout North America, NFPA 1: Fire Code presents a comprehensive, integrated approach to fire code regulation and hazard management. Fully updated for 2015, this edition features extracts from and references to more than 130 NFPA codes and standards. Staying up-to-code gives fire marshals, AHJs, code officials, inspectors, facility owners and managers and anyone involved with hazardous materials with the latest fire protection requirements for fire alarm, sprinkler, and life safety issues. Download this fact sheet and print it out. It is intended to help advance the safety of mobile and temporary cooking operations. NOTE: This information is provided to help advance safety of mobile and temporary cooking operations. It is not intended to be a comprehensive list of requirements for mobile and temporary cooking operations. Check with the local jurisdiction for specific requirements. This safety sheet does not represent the official position of the NFPA or its Technical Committees. The NFPA disclaims liability for any personal injury, property, or other damages of any nature whatsoever resulting from the use of this information. 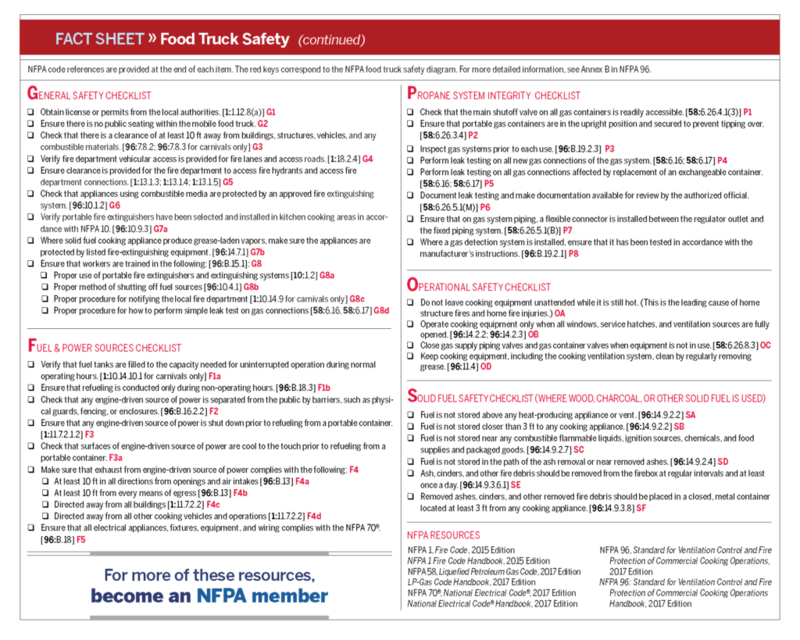 For more information, go to nfpa.org/foodtrucksafety. In this video, National Geographic® talks about the growing popularity of food trucks. National Geographic® is a registered trademark of the National Geographic Society or its affiliates. National Geographic® and the local jurisdictions identified above are neither sponsors of nor affiliated with nor have they endorsed or approved this site. Install an automatic fire-suppression system in the truck. Because 57% of food service business fires involve cooking equipment, most municipalities require this equipment to be installed. These systems automatically dispense chemicals to suppress the flames and also have a manual switch. Activating the system automatically shuts down the fuel or electric supply to nearby cooking equipment. Have your fire-suppression system professionally inspected semiannually. The manufacturer can refer you to an authorized distributor for inspection and maintenance. Keep portable fire extinguishers as a backup. Class K extinguishers are designed for kitchen fires involving grease, fats and oils that burn at high temperatures. Class K fire extinguishers are only intended to be used after the activation of a built-in hood suppression system. Keep Class ABC extinguishers elsewhere for all other fires (paper, wood, plastic, electrical, etc.). Remove ashes from wood- and charcoal-burning ovens at least once a day. Store flammable liquids properly. Keep them in their original containers or puncture-resistant, tightly sealed containers. Although a food truck kitchen is very small, you should attempt to store containers in well-ventilated areas away from combustible supplies, food, food-preparation areas or any source of flames. If a fire breaks out in your food truck, your staff must take control of the situation and all employees must safely exit the vehicle and lead customers to a point safely away from the truck. Be prepared to power down. Train at least one worker per shift how to shut off propane and electrical power in case of emergency. Have an evacuation plan. Designate one staff member per shift to be evacuation manager. That person should be in charge of calling 911, determining when an evacuation is necessary and ensuring that everyone exits the food truck safely. Ensure your staff knows where all of the exits are.